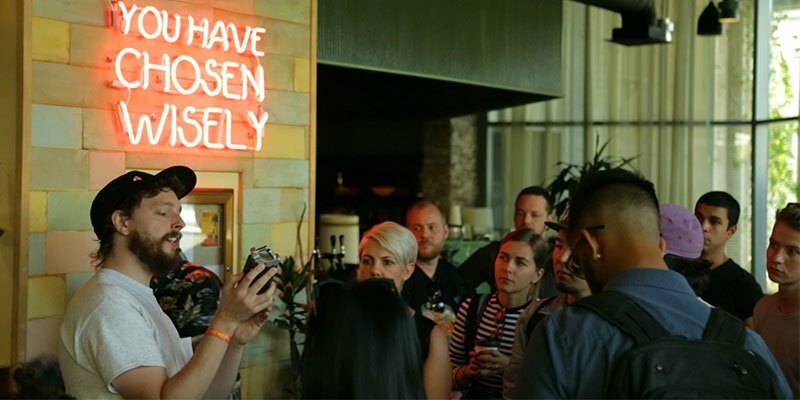 For a sound designer with as global a portfolio as Ally Mobbs, it was surprising to learn that the 2018 Loop event in Hollywood represented his first time in the United States. Starting as a bassist in the UK, a 2009 move to Japan inspired Mobbs to begin working with DIY electronic instruments and field recording. With frequent collaborator Agargara (David Cummings), Mobbs assembled the Beat Picnic, a group of like-minded producers in Japan. Flash forward to Loop 2018, and “Beat Picnic” is also the name of an event on the program at Ableton’s music-makers summit. Starting with lunch, followed by a stroll around Hollywood collecting field recordings, and ending with sessions and a sharing salon at IO Music Academy. For Mobbs and most participants, it represented a sojourn into unfamiliar territory in the quest for inspiring sounds – from the clang of a rusty “No Parking” sign to the soft whistle of wind through tall grass outside a cemetery. What are some of the sounds that you/the participants in Beat Picnic were most inspired by finding? I’d never been to LA or America before so the whole thing was massively inspiring. Hollywood was full of new sounds for me. One of the participants recorded a guy who was loudly freestyling to himself while walking across the opposite side of the street. Another was recording a guy revving his car engine; when the driver asked what they were doing he offered to do more revs. Like a car sound performance. The subway had some great mechanical sounds in it too. What are some of the resulting pieces that you found most interesting/inspiring? That’s a hard question, because hearing the results from participants was mind blowing! The end goal of the session was to use the collected recordings to make either a drum rack or sampler patch or just edit some sounds that participants could use in their future productions. People came up with some really inspiring stuff. One guy made two full beats! It was the sharing of workflows and seeing different ways of working that was most interesting to me. There was one participant with a background in location sound for film who made a minimally processed sound collage in Pro Tools. Listening to it just takes me straight back to that day recording on a hot dusty LA street. Rewinding a bit, let’s talk about your start with field recording. How did you start, technology-wise? My first real experience of field recording was just using my phone. Living in Japan I was interested in all the new sounds around me. If something caught my ear I would take a quick voice memo. I met some similar-minded producers and started Beat Picnic with Agargara (David Cummings) as a way to challenge ourselves to make music using only the sounds we could find around ourselves. It was just something we did every now and then to get out and try something different in a new place each time. After the first Beat Picnic I became more interested in recording and manipulating field recordings for making my own original sounds that told a story that was relevant to my daily life and so I slowly started investing in better tools for the job. It was really inspiring to learn from other peoples’ results and methods for working in this way and it sparked a real interest in working with sound. Who are some artists/recordists who influenced your methods? Jonáš Gruska, who runs the label LOM and builds his own mics under the same name, made a DIY kit of his Elektrosluch device. It’s an electromagnetic pick up that lets you hear all kinds of weird sounds. Walking through a supermarket or electronics shop listening with it is pretty interesting. I also really like the DIY ethos that shows you don’t always need super expensive microphones to record high quality sound. Agargara is an amazing producer and his first Beat Picnic track is still my favorite. 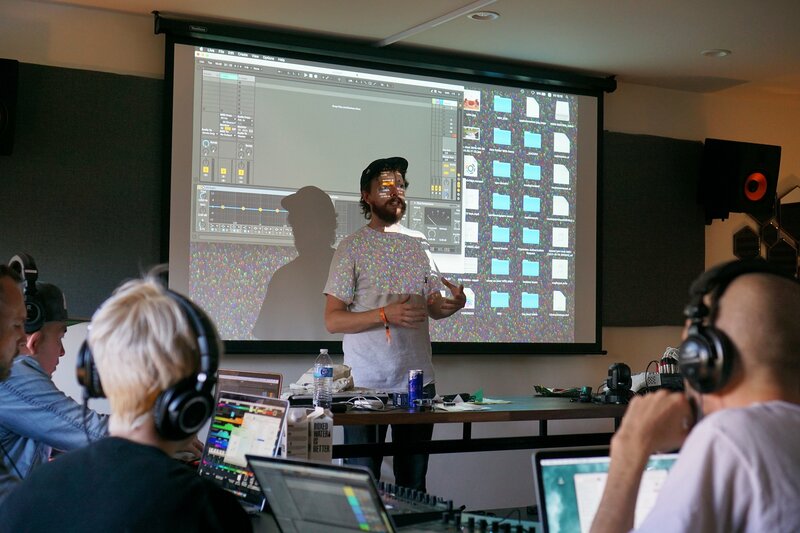 He was working with Renoise and I learned a lot of tips from seeing how he made that track that I could still carry through to my use of Ableton Live. When were you first introduced to Ableton Live? I first encountered Ableton Live with version 7, and finally bought it when Push came out. I had been using an unreliable DIY Arduinome version of the Monome and some hacked-together, game pad-based midi controllers for finger drumming, and when I saw Push I was really excited about it. Something self-contained and reliable that suited my needs. How do you work with your field recordings in Live? My workflow is pretty centered around Push these days, so I will first rename all my recordings with easily searchable names and then drag the ones I want to use into Session View. I'll then start chopping stuff up in Drum Racks if I'm working with percussive sounds, or lay things out in the Arrangement View if I am using ambient field recordings as a layer in my music. Ally makes a beat on Push 1, under cherry blossoms in Kyoto. What do you look for when you’re taking field recordings? These days I’ll usually be out looking for specific sounds depending on the project I’m working on. For example, I’m currently working for a game company that needed a lot of natural ambient sounds like rivers, waterfalls, bugs, frogs, birds, rock and sticks etc. In those kinds of cases my first thought is, “where can I go with those features that will have the least amount of unwanted background noise from traffic?” I ended up loading my gear onto my bike and going for a camping/recording trip into the mountains that surround Kyoto. But even there you can still hear planes flying overhead! I find that some of the most interesting sounds are the ones you encounter by chance day to day. It might be something as simple as a crosswalk making pip tones or the hustle and bustle of people in a station with interesting acoustics. Nine times out of 10 I will have a portable recorder in my bag, but if not, then a phone recording is better than nothing. Do you tend to interact more with your environment (e.g. banging on things, throwing things around), or do you prefer going for naturally-occurring sounds? When I was first doing Beat Picnic, there would be a bunch of weirdos tapping and banging on stuff. These days unless I find a particularly interesting object that I can’t help but knock on I tend to prefer naturally-occurring sounds. There are a lot of traditional festivals in Kyoto and often I’ll be riding about and just encounter some traditional music coming from a temple. I also collect supermarket theme songs that they play out of these weird tape players with happy faces and mechanical waving arms. (You can hear one used in my track, “MEAT!”) Those kinds of sounds I like to work into my productions because they relate to where I live and help convey my daily inspirations. I got in trouble once for micing up the shinkansen with contact microphones at the intersection where the two carriages meet. Someone must have thought I was doing something sketchy and reported it to the train guard. He was alright about it after I explained the situation though. The best thing I have ever recorded was Gion Matsuri in Kyoto. They have these giant three-story high "Hoko" wagons that they drag through the streets with musicians inside. I was given access to walk right behind the axles and wheels and record the grinding of the wood with the guys who haul them. When they get to an intersection they throw strips of bamboo and water down to reduce friction and heave the wagons round 90 degrees with ropes and lots of shouting. Most dangerous would be recording this really terrifying powerful old lady kicking off and shouting at convenience store staff later that night. They were being super polite trying to calm her down and I was trying to lowkey record the whole thing while she berated everyone around her. What are some practical tips for adapting field recordings into music – e.g. certain sounds that work well in the place of percussive sounds, or ways to finesse sounds to get them to fit? If you are out looking for things to record and use as drums, then think about what objects are going to produce the kind of frequencies you would need to mold that sound into what you want. Hard metallic objects for hi hats, gravel foot stomps or snow steps for snares, use your imagination and have fun. Some of the recordings will be useless but some of them might be exactly what you want and the whole point is that no one else has that sound. It’s yours, you found it and it’s not in anyone else’s sample packs or libraries. Effects-wise you could add anything you like but useful ones for me are EQ Eight, Compressor, Drum Buss (I love Drum Buss), Tuner and Utility combined with layering, re-pitching and Warping as well as Simpler’s envelope and filter section. Then once you have your basic sound you can go crazy with whatever other effects you’d like. Ally Mobbs making a beat with Push 2, by the water in Kyoto. Learn more about Ally Mobbs at his website, and follow his adventures in sound on Instagram and Bandcamp.